Where’s the bottom for this crash? We are in a crash currently. It is more than just summer doldrums. It may not be as deep and as comprehensive as the 2008 crash but we still have a way to go to hit bottom. Every crash always presents a new investing opportunity (even for pessimists). But it is trying to predict the bottom while the crash is occurring that is difficult. Lagging indicators like gold are not particularly useful. As a layman investor, I can only try and define parameters which I believe represent the bottom. Of course these parameters are never all met simultaneously and can even seem to be opposed in phase. Finally, any investor will just have to take a call. I find inflation and interest rate movements in different countries too complex and too confusing to be useful as indicators. Inflation is at unhealthily low levels globally but is a very “messy” indicator since countries and regions are not in phase. My expectation is that the markets reaching bottom will coincide with EU inflation having picked up and approaching about 1% (average) – probably by the end of 2016. US and China should exhibit somewhat higher values while inflation in India should still be trending downwards and approaching about 3%. Interest rates in the EU and the US will only pick up once inflation can be seen. In India interest rates are far too high for the prevailing inflation, but the fear of rampant inflation is so high that rates are not being reduced as they should be. I suspect that Indian interest rates will not reduce till after all the “monsoon risk” has passed. That takes us to after October this year. That leaves me with two “indicators”. I think the first has to be the Chinese markets (which embodies all the Chinese parameters). Irrespective of what happens elsewhere, the global economy needs the Chinese economy to stabilise and start moving upwards again. The bubble has burst but all the excess has not yet been expelled. 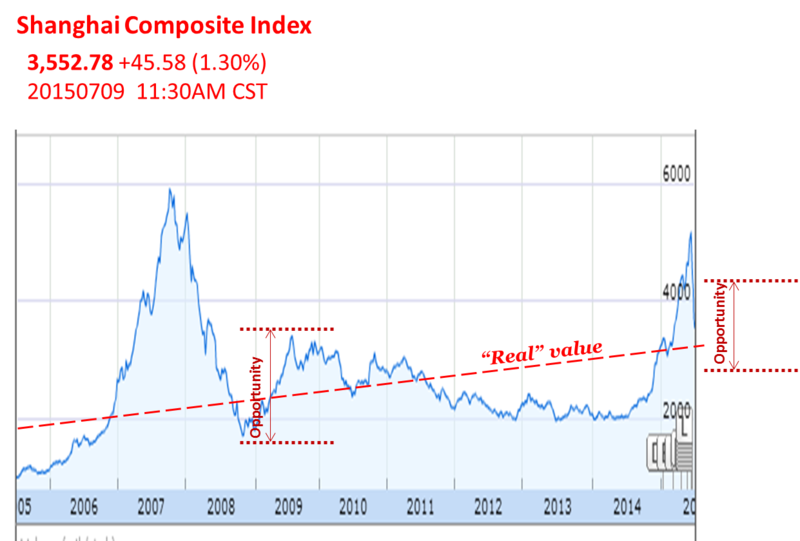 The bottom for the Shanghai Composite Index lies at about 3100-3200. That is about 15% lower than current valuations. Because of recent forced share buying activities by the Chinese institutions the market distortions and the Chinese “slowdown” will run till November/ December this year. The Chinese “opportunity” will come when the SCI falls back to the level of the underlying, sans bubble, growth. The current value is just over 3500 (the same as about a month ago). 2. Oil – Oil price is still much too high for the glut that exists. Iran is coming back into the picture and fracking is getting cheaper. Currently WTI is just above $40/barrel with Brent at $45. Any recovery will need the perception that energy costs will be sustainably low. That I think will be when prices are around 20-30% lower than today. Possibly with WTI back to its “traditional value” of $30/ barrel with Brent at about $34. This entry was posted on August 21, 2015 at 9:35 am and is filed under Economy. You can follow any responses to this entry through the RSS 2.0 feed. Both comments and pings are currently closed.